Welcome to van der Gaag Guitars! We manufacture guitars, Mandolins, Dobro and Irish bouzoukis for those who love high quality in workmanship and sound. Our instruments are handmade and custom built, according to your wishes, sky is the limit. Despite of our competitive prices we always build to your custom design. Your Guitar or Bouzouki will always be 100% unique and 100% "your very own"
Johan...Thank you very much for the great job you did in adding a bit extra to my brothers acoustic guitar, and thanks for making us feel like a kid in a guitar candy store by letting us play all your beautiful masterpieces and showing us your amazing work shop. Look forward to seeing you again soon my friend. Have a blessed and wonderful day. God is opening Doors for me everyday. I feel so blessed the lights get brighter each time one day I’ll walk into the blue sky where the sun is shining. And it’s you guys believing in me that’s making that sun shine through. I Will have news For you all soon. thank you Johan van der Gaag. This guitar is pushing me so much. Your awesome God bless. As promised, I’ll send you my experience with the purchase of one of your Bouzouki. I was looking quite a while now for a replacement of my old Greek bouzouki. I used this instrument in our Folk-Rock band Chimera. 2 years ago after restarting our band Chimera I found a cheap alternative for my old Bouzouki, an Irish Bouzouki from Richwood. Because we are getting more serious with the band I started looking for a better instrument and via Ad Vermeer from Rotterdam I came in contact with van der Gaag Guitars. From our first contact I just knew it would be the start of a very nice and exiting project, I saw some readymade instruments and could try out a few. After that we put together my wishes for a custom built Bouzouki, everything was possible, like the type of woods used, shape of the head, the tuners, purflings, neck with and length. I had also a special requirement qua tuning, I always use the tuning A-E-B-Fis, so because of the greater tension on the neck You’ve made the neck stronger by laminating. During the building you have kept me informed by sending pictures on every stage of building. I’m sure I will have a lot of fun and satisfaction with this instrument. Also I received some nice after care, with a free first maintenance job, all in all heaps of quality for a nice price. I have recently had the privilege of building my first guitar at van der Gaag guitars. The woods we selected for this OM shaped guitar are locally milled, selected and seasoned. 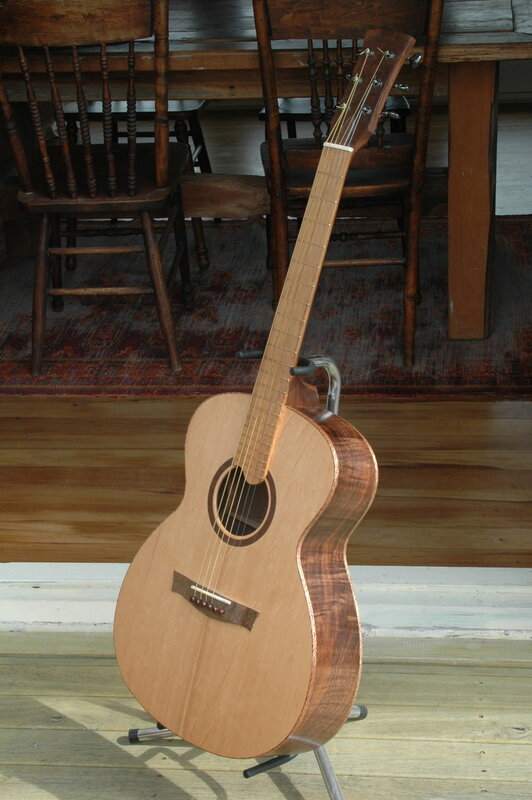 They include Black Walnut back , sides , neck and rosette Spruce soundboard Rewarewa binding and Black maire fretboard. amongst my collection of factory made acoustics. She has the exceptional tone and resonance only available from a solid wood guitar. This quality is also improving over time as the wood matures and opens up. been the the most rewarding project I have ever undertaken. I highly recommend this to anyone. As a student you are taken step by step through a fascinating process of construction by Johan then you have the satisfaction of playing your own handmade stringed instrument. with a different selection of woods and shape. Now after an other couple of years I’m on my 5th, yes!